A recent anonymous comment motivated me to do a little research on Queen Letizia of Spain. In my 30 second assessment it appears as if she and Duchess Kate share a similar "look". The most recent audiences as reported and illustrated by www.queenletiziastyle.com. shows the queen in skirts and tops and dresses. I enjoy the website because it will comment and have photographs of outfits or pieces she has worn before. Another similarity to Kate Middleton. There is something endearing about the fact that they are comfortable enough to wear repeat outfits in a world assessing them every time they walk out their doors. The recent post shows a white tweed dress she has worn on three occasions in 2017 and 2018. Check out queen letiziastyle. Another more casual style I found on the website and one fitting for a summer evening is an ensemble that is easy to duplicate. The website also shows Queen Letiza Looks for Less - love it. The pin-tuck shirt style is tailored with long-sleeves and a standup collar. You can easily find something similar if you check out the Gap or Banana Republic retail websites. But make sure you look for fitted shirts and not those one-size-fits-all varieties that pin-tuck is often used on. I had a fitted pin-tuck front shirt in white with a "man's shirt collar" more years ago than my closet reveals for it is no longer there and I have long forgotten about it until I saw the Queen Letizia photograph. It's items like that, one wishes to have kept . . . maybe not. 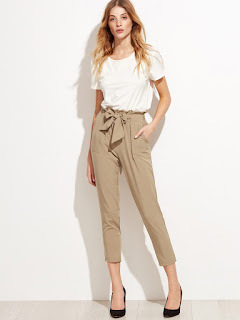 The trousers have more detail but if you are going to spend more money on something, a pair of pants like this would be your choice over the shirt. The QL style website links us to Romwe.com where a similar look is being sold for $9.00 US. I have bought linen pants from a grocery store in France for about that price but the furthest I venture out with them is to the market. They don't fit well and the seams are sewn with long stitches that save thread. Romwe is selling a polyester version and my first thoughts are No Thanks to the polyester but Note-Worthy to the style. Queen Letizia was wearing smooth leather camel pumps with block heels. Nice. Hers are from a season past but the Hugo Boss website has a pair of black velvet pumps that are similar. Queen Letizia's style befits a contemporary queen and we can also learn a thing or two from her. The QL style blog does a nice job of cataloguing three looks with one clothing item and it's worth repeating here. Change the shoes, the skirt, and the pants - the look stays elegant and the style says this woman has her priorities in the right place.